Montados are silvo-pastoral systems, typical of the western Mediterranean Basin. When well managed, these ecosystems provide relevant ecosystem services and biodiversity conservation. In the northern part of the Mediterranean Basin, cork oak areas are mainly privately owned and a source of income to landowners, chiefly through cork and livestock production. Sustainable use is essential to maintain the ecological sustainability and socio-economic viability of these ecosystems. Biodiversity conservation and non-provisioning ecosystem services may generate additional incentives promoting sustainable use and conservation of montados, but require adequate mapping and identification. The high conservation value forest (HCVF) framework allows systematic inventory of biodiversity and non-provisioning ecosystem services and is widely applied in forest ecosystems. Here we exemplify the application of HCVF to the cork oak landscape of southern Portugal using a WebGIS tool that integrates the HCVF framework, in conjunction with Pareto optimization, to identify areas important for the conservation of biodiversity and ecosystem services. We present a case study using threatened bird and reptile species, as examples of biodiversity attributes, and carbon storage and water recharge rate of aquifers, as examples of ecosystem services attributes. We identify those areas in a cork oak landscape of southern Portugal where biodiversity and ecosystem services attributes are optimized. These areas can be prioritized for implementing conservation mechanisms, such as payment for ecosystem services, to promote sustainable forest management. M. N. Bugalho and F. S. Dias joint first authorship. 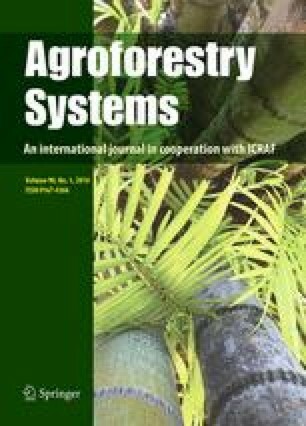 We are grateful to Teresa Pinto Correia and Maria Isabel Ferraz de Oliveira for their invitation to participate in the ICAMM 2013 International Conference “Acknowledging montados and dehesas as High Nature Value Farming Systems” under which this paper was developed. We thank Manuel de Oliveira from LNEC and Ana Lopes from APA for providing the information on aquifer recharge rates. We also thank M.C. Caldeira, V. Acácio and three anonymous referees, which greatly improved a previous version of the manuscript. The Portuguese Science Foundation funded MNB (Program Ciência 2007, grant SFRH/BPD/90668/2012 and FCT IF/01171/2014 contract), FSD (grant SFRH/BD/69021/2010) and JOC (project UID/MAT/00297/2013. Funding to BB was provided by the International Master on Mediterranean Forests (MedFOR), School of Agriculture, University of Lisbon.